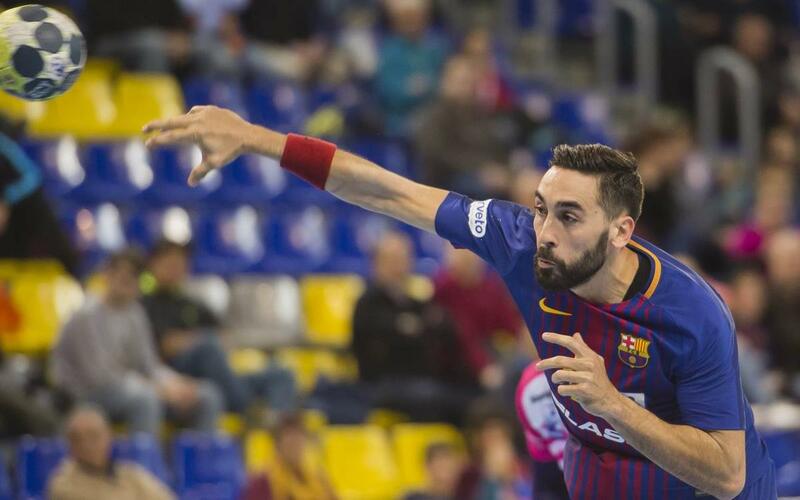 Barça Lassa beat Frigoríficos Morrazo 36-21 on Matchday 23 of the Lliga Asobal, in a game held at the Palau Blaugrana. In a top versus bottom clash, the home side's start to the second half proved decisive. With 13 goals, Valero Rivera was the man of the match, although Borko Ristovski also impressed with his great defensive work and two goals. The win, combined with that for Ademar de Lleó against Teucro, mean Barça are just one win away from clinching the league title. The game began with Barça Lassa imposing their strategy, as goals from Rivera and Aleix Gómez quickly moved them in front. During the opening stages, the defence dealt with all but one of the efforts from the opposition. Frigoríficos Morrazo took the score to 6-4 in the twelfth minute, clawing their way back into the game. However, goals from Jallouz and Palmarsson meant that the away team would call for a timeout. With the score at 11-9 on 23 minutes, Pascual rotated his side. Goals from Ristovski and Rivera closed the first period 17-11. Upon the restart, Barça Lassa extended their lead to 22-13, as Rivera continued to fire in the goals. When they continued to manage this advantage and the pace of the game dropped, the home team established a definitive 36-21 lead -with Yanis Lenne especially active. Barça Lassa are just one win away from an eighth consecutive Liga Asobal title.